Elac announces launch of new Line 70 and Line 260 loudspeaker ranges | What Hi-Fi? If you're looking for new speakers for your system, German manufacturer Elac has unveiled two new ranges that cater for the mid-range and high-end segments respectively. The launch of the Line 70 and Line 260 (above) series comes just months after we first saw the Air-X active wireless speakers make their debut at the Bristol Sound and Vision Show. 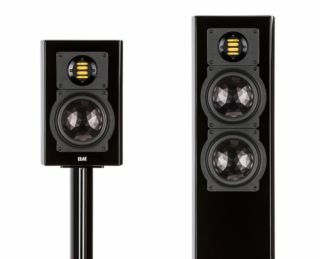 An "attractive mid-range offering", the new Line 70 range comprises no less than five models; from the two-way BS 72 (above) to the large three-way FS 78 floorstanding loudspeaker. The BS 72 weighs in at 3.2kg and features a 25mm dome tweeter and a 116mm cone woofer, with the BS 73 the next step up at 5.6kg and incorporating a 150mm cone woofer. Line 70 also boasts the CC 71 and FS 77 – both with two 150mm woofers and 25mm tweeter – and the FS 77, which has two 178mm woofers, a 116mm mid-range and 25mm tweeter. Meanwhile, the new Line 260 series is targeted at the high-end market and includes the latest JET tweeter technology – inspired by Oskar Heil and now into its fifth generation. The JET tweeter is engineered at Elac's Kiel headquarters and the manufacturer is hoping it'll go from strength to strength now that it has been implemented in this latest range. There'll be an initial two models in the range – the compact BS 263 and floorstanding FS 267 (above). It features Van den Hul wiring and sports a brand new curved cabinet design. If your interest has been piqued by these latest speakers from Elac, you'll want to know the all-important pricing – starting with the Line 260, with the BS 263 costing £1250 for a pair and a pair of FS 267s coming with a price tag of £2450. Back to the Line 70 and the CC 71 costs £289 per unit, with the BS 72 (£349); BS 73 (£439); FS 77 (£899); and FS 78 (£1219) all priced per pair.